twin tastes : Pasta Party! This past Saturday, our buddy and fellow twin, Pete invited some friends over for a pasta making party. 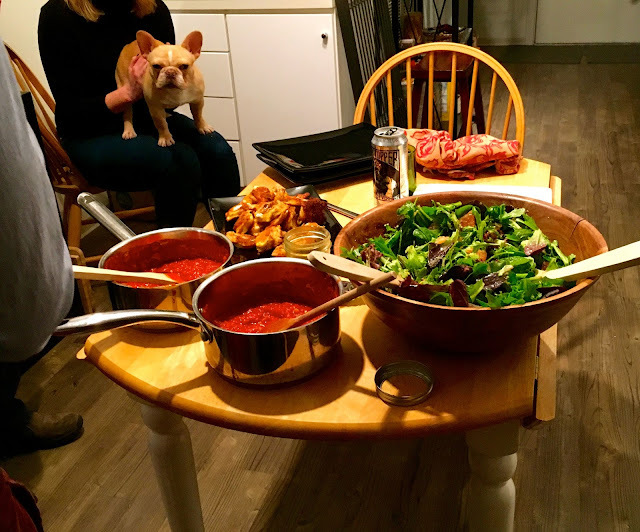 Upon entering Pete’s industrially chic and modern apartment, we were hit by wafts of bubbling marinara sauce, classic rock tunes, and our smiling plaid-clad friends. We grabbed a glass of red and dove into the fun. 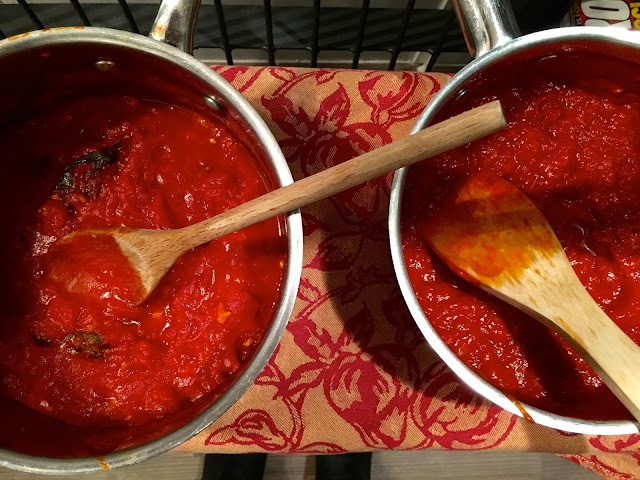 With Italian blood in his veins, and experience experimenting with pasta at the Cambridge School of Culinary Arts, we knew Pete had some epic dishes in store. Pete had already prepared the ingredients and rolling station ahead of time on his center table. 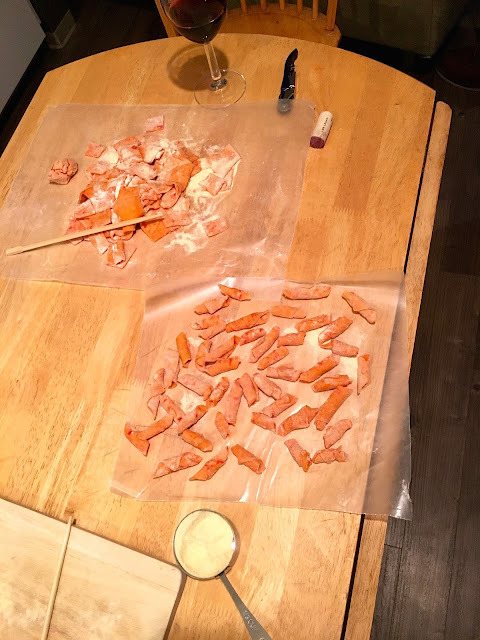 We started by rolling roasted pepper dough into garganelli with chopsticks. 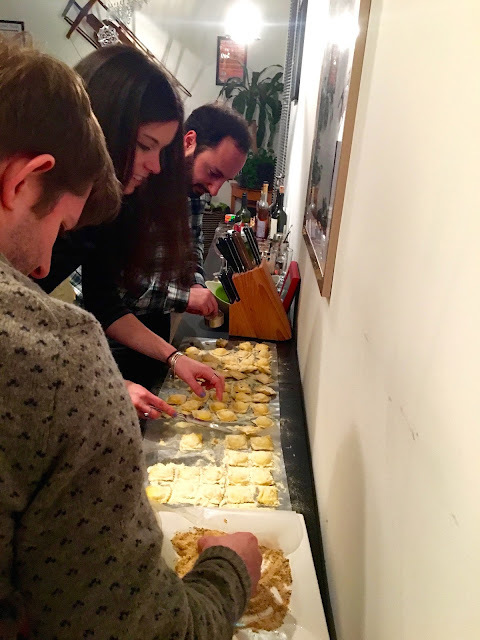 We then breaded and fried ricotta and parmigiano reggiano ravioli that Pete had prepared ahead of time with his very own ravioli mold. Who knew pasta raviolis could be transformed into wonderfully crispy pockets of melty cheese? 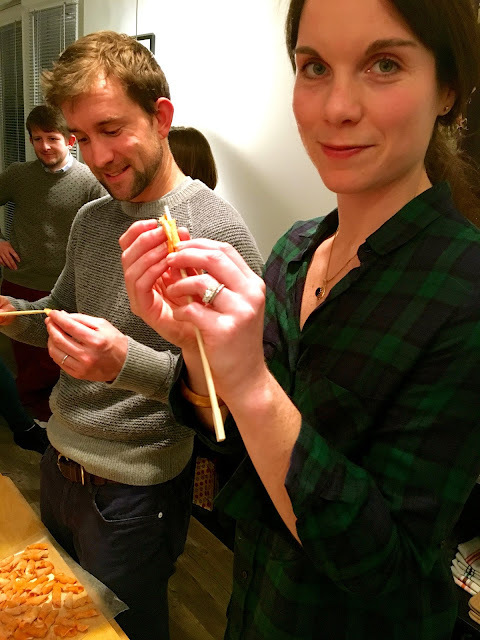 We had a blast rolling, dipping and frying while nibbling on bruschetta and antipasti. 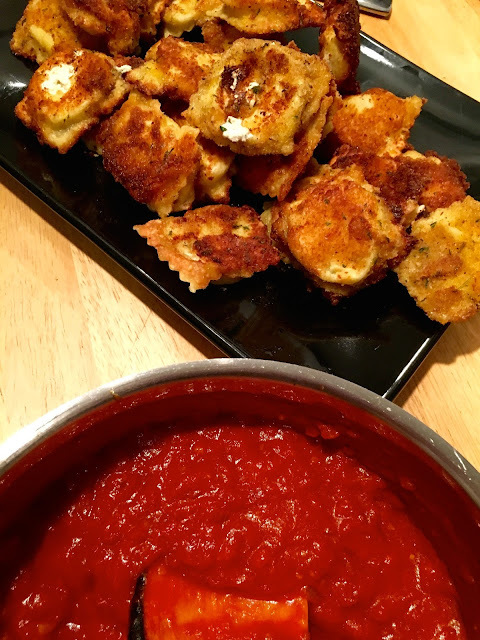 The addictive fried ravioli bites reminded us of a sophisticated mozzarella stick dipped into tangy marinara. We left the interactive dinner inspired to create our own. Of course the recipe tastes better with homemade raviolis and marinara sauce, but we are not going to reveal Pete’s secret recipe for either of those. Ravioli-master Pete says he likes to add nutmeg to his cheese filling and for the tomato sauce punch, a nice addition of red pepper flakes and basil. Below is the basic method of breading, dipping and frying. In a shallow bowl beat the eggs with salt and pepper. In another shallow bowl, add the breadcrumbs. Dip each ravioli into the eggs, then into the breadcrumbs. Make sure the entire surface is covered, shaking off excess. 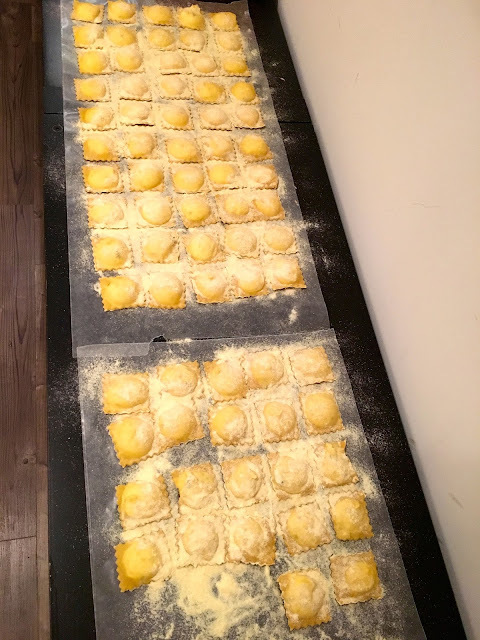 Place on a plate and continue with the remaining raviolis. Pour 1 inch of vegetable oil into a large frying pan and heat over medium. When the oil is hot, fry the raviolis, about 7-8 at a time, depending on the size of your pan. Turn occasionally and fry until golden brown, about 1-2 minutes. Once crispy and golden, remove the fried raviolis to a paper towel-lined plate. Repeat with the remaining ravioli, adding more oil if necessary. Sprinkle the raviolis with grated Parmigiano Reggiano and warm marinara sauce for dunking. We’re already brainstorming our next interactive dinner party! Oh and can’t forget a sweet ending - we provided our gooey s’mores bars to share.